We have been very successful in meeting the particular challenges of revamps in existing plants. Using a project-based team model we provide a cost effective and flexible approach for all sizes of projects. 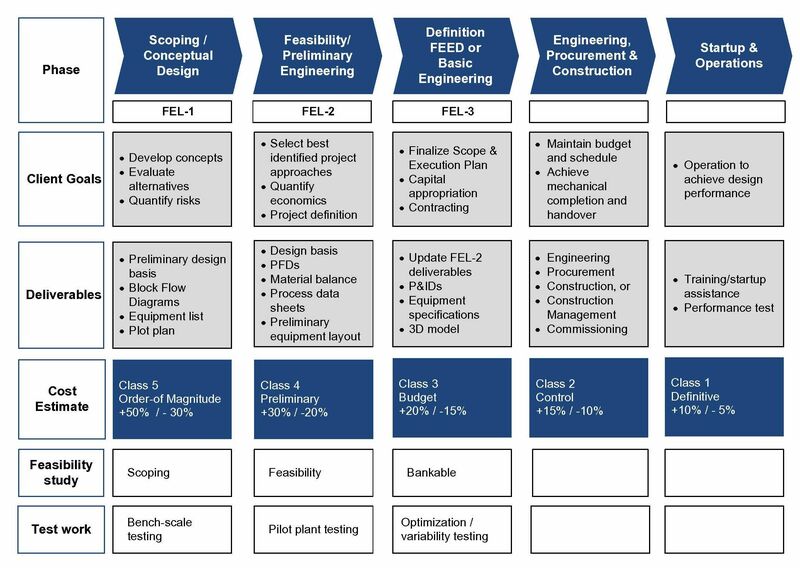 KEMWorks can provide these deliverables as part of a Phosphate Development Project. Process simulations/ calculations as required to complete the above. All of these drawings should preferably be finalized to status AFD (Approved For Design) which means that they are completed in all aspects except for what will be decided in the Detailed Design phase (vents/drains, vendor data etc.) Depending on project/company strategy, it may well be decided to issue the BD package for a Bankable Feasibility Study with a level of completion lower than AFD. define basic routing of distribution headers so these can be sized. This level of detail in the piping layout may not be required for a BFS. All further design is developed until it reaches AFC status (Approved for Construction). For process design (assuming the Basic Engineering outcome was status AFD) remaining work will be limited to verifying that the actual piping layout, the equipment purchased etc is in line with the present process design and incorporate any updates required. Typically procurement of main equipment takes place during the detailed design stage and this requires interaction from the process engineer as well as other disciplines. In addition to the above comes all the electrical, instrumentation, structural, building, and architectural works. KEMWorks’ role in this phase may be to provide detailed design of certain key items of equipment, for example phosphoric acid plant reactors, flash coolers, and scrubbers. It may also provide design reviews for the client or detailed engineering contractor. We can help draw your project to a start by assisting with commissioning and start-up, Operating and Maintenance Manuals, and Training. We can offer follow to improve operations with technical audits.